I am elated to announce my five Naughty Ladies of Nice books are now available in a boxed set for $1.99. To read more on these books or purchase, please click a vendor’s name. All Chef Ramsay’s books are available at your local bookstores and from Amazon. Gordon Ramsay’s World Kitchen is filled with recipes from starters through desserts from ten different countries. If you’re not a fish lover, don’t be swayed from this exceptional book. There are scads of recipes you’ll still love to prepare and eat. We have two favorites I’ve prepared for us and company. First is wild mushrooms on griddled polenta with pecorino, page 37. This appetizer has a beautiful aftertaste. The other is buffalo chicken wings with sour cream and chive dip, page 232. They are so flavorful you can make a meal on them alone. Chef Ramsay makes it easy with photos and concise direction for preparation. 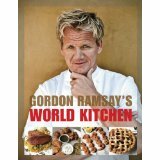 From novice to expert, Gordon Ramsay’s World Kitchen is a cookbook every kitchen must own.